A/Prof Saddichha Sahoo is a Consultant Psychiatrist experienced in assessment and management of patients with mental illness including depression, anxiety and mood disorders. He has special interest in substance dependence issues and medical liaison, and is accredited as Addiction Psychiatrist and Consultation- Liaison Psychiatrist by RANZCP. Additionally, he has a special interest in Indigenous Mental Health from his work in this population while working as a Consultant Psychiatrist with Vancouver Coastal Health, Canada. 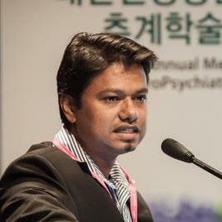 A/Prof Sahoo currently serves as Consultant Psychiatrist at Ipswich Hospital and St Andrew’s Private Hospital. He is also an Associate Professor at the School of Medicine at the University of Queensland teaching Addiction Psychiatry and Psychopharmacology. Previously, he trained and worked in India, and has since held appointments in Canada as Consultant Psychiatrist at Vancouver Coast Health in the management and rehabilitation of dual diagnosis patients, and University of British Columbia where he completed a Fellowship of Addiction Psychiatry. Additionally, A/Prof Sahoo serves on the Education Committee for the American College of Clinical Pharmacology, and the Young Scientists Committee of the International College of Neuropsychopharmacology. He has been elected to the RANZCP Committee for Evidence Based Practice, and is the recipient of several international academic awards and prizes. He has authored/reviewed numerous articles published in peer reviewed journals, and has also contributed to book chapters. Saddichha, Sahoo and Talukdar, Daisy (2014) Serpentine Tongue Syndrome Associated With Risperidone Long-Acting Injection Treatment. Journal of Clinical Psychopharmacology, 34 5: 657-658. Cognitive schemas among mental health professionals: Adaptive or maladaptive? Saddichha, Sahoo, Kumar, Ajay and Pradhan, Nirmala (2012) Cognitive schemas among mental health professionals: Adaptive or maladaptive?. Journal of Research in Medical Sciences, 17 6: 523-526. Koro: culture bound or mass hysteria? Disease Mongering in Psychiatry: Fact or Fiction? Saddichha, Sahoo (2010) Disease Mongering in Psychiatry: Fact or Fiction?. Journal of Nepal Medical Association, 50 4: 320-327. Saddichha, Sahoo, Rekha, Dorothy P., Patil, Basanagouda K., Murthy, Pratima, Benegal, Vivek and Isaac, Mohan K. (2010) Knowledge, Attitude and Practices of Indian Dental Surgeons Towards Tobacco Control: Advances towards Prevention. Asian Pacific Journal of Cancer Prevention, 11 4: 939-942. Saddichha, S. (2010) Metabolic syndrome in mental illness: evidence and way out. International Journal of Clinical Pharmacology and Therapeutics, 48 1: 84-86. Is 47 XXY the Genetic Marker for Aicardi Syndrome? Is the male Aicardi's characterized by 46 XXY karyotype? Clinical Antipsychotic Trials of Intervention Effectiveness Study A Pragmatic Trial? Manjunatha, Narayana and Saddichha, Sahoo (2009) Clinical Antipsychotic Trials of Intervention Effectiveness Study A Pragmatic Trial?. Journal of Clinical Psychopharmacology, 29 4: 410-411. Mental capacity - Who decides on treatment for mental illness? Sahoo, Saddichha, Ameen, Shahul and Akhtar, Sayeed (2007) Metabolic syndrome in drug-naive first-episode psychosis treated with atypical antipsychotics. Australian and New Zealand Journal of Psychiatry, 41 7: 629-629. Sahoo, Saddichha (2007) Aripiprazole in a patient susceptible to urinary side effects of antipsychotics. Israel Journal of Psychiatry and Related Sciences, 44 1: 74-75. Saddichha, S. and Murthy, P. (2014). Family Genetics of Alcohol Dependence: a Case Control Study Among First and Second Degree Relatives (Fdr and Sdr). In: Australian and New Zealand Journal of Psychiatry. , , (123-124). .
Sahoo, Saddichha (2012). Family genetics of alcohol dependence: Co-morbidity and co-aggregation. In: Asia-Pacific Psychiatry. , , (96-96). .
Saddichha, S., Chand, P., Benegal, V., Jain, S. and Murthy, P. (2011). FAMILY GENETICS OF ALCOHOL DEPENDENCE: COAGGREGATION AND COMORBIDITY AMONG FIRST (FDRs) AND SECOND DEGREE RELATIVES (SDRs) OF ALCOHOL DEPENDENT PROBANDS. In: Alcoholism-Clinical and Experimental Research. 34th Annual Scientific Meeting of the Research-Society-on-Alcoholism, Atlanta Ga, (194A-194A). Jun 25-29, 2011. Saddichha, S. and Akhtar, S. (2011). Prehypertension, Hypertension and Cardiometabolic Changes Associated with Antipsychotic Use in Schizophrenia. In: Basic & Clinical Pharmacology & Toxicology. , , (33-33). .
Saddichha, S. and Benegal, V. (2011). Sexual Dependence in Substance Use. In: Journal of Sexual Medicine. , , (182-182). .
Saddichha, Sahoo, Manjunatha, Narayana and Akhtar, Sayeed (2010). Obesity, Diabetes and Hypertension Associated with Antipsychotic Use in Drug Naive Schizophrenia. In: Australian and New Zealand Journal of Psychiatry. , , (A12-A13). .
Prevention of alcohol dependence by legislative control of alcohol: Unmet need of public health policy? Saddichha, Sahoo, Manjunatha, Narayana and Khess, Christoday R. J. (2008). Prevention of alcohol dependence by legislative control of alcohol: Unmet need of public health policy?. In: Australian and New Zealand Journal of Psychiatry. , , (A112-A112). .